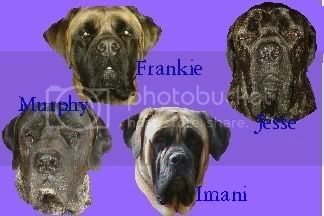 Please input the info on each of your mastiffs here to assist the research for better health in mastiffs. PLEASE request and submit this DNA test kit on each of your registered mastiffs. They need samples from ALL mastiffs, not just those who are effected. Together, we can help the researchers improve the health of our pets and for future generations. Please- pet owners and breeders alike- your input can make a difference in the health of our babies and the future of the breed in general.